Teeth sucking and copious sighing, that's pretty much the drill whenever stereoscopic 3D technology is mentioned round here - in its current format, we don't entirely jive with 3D. But if the very mention of it brings on eye-bork, ponder this: if it weren't for 3D tech, the rise in high-refresh PC monitors wouldn't be happening. Before the arrival of 3D technology, most people pooh-poohed the idea that there was much to gain by going beyond the default 60Hz on a flat panel monitor. And we'd have agreed with them. Yes, higher refreshes had previously been popular on old-school CRT monitors, but that was a flicker-related issue and LCDs don't flicker at any refresh - it's just not how they work. Anyway, as soon as we first enabled the 120Hz refresh rate while testing Nvidia's 3D Vision, the benefits for 2D image quality were immediately obvious and rather surprising. Put simply, 120Hz is massively smoother and far slicker. That goes for everything from gaming to just juggling application windows on the desktop. The only significant exception is video content, which is coded in fixed frame rate formats so, for the most part, a screen refresh rate above the frame rate is redundant. Enter the memorably named Iiyama ProLite G2773HS and its 120Hz refresh capabilities. Thanks to that high refresh rate, it is in fact compatible with active shutter 3D platforms such as Nvidia's 3D Vision. But that's not how the panel is being pitched. Nope, it's being sold mainly on the all-round benefits of 120Hz, which suits us just fine. 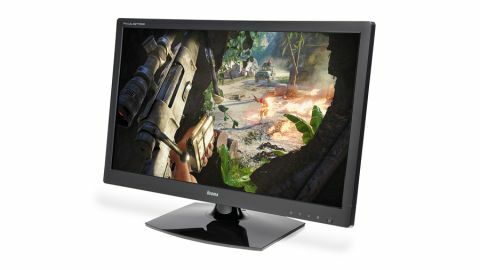 Size-wise, we're talking 27 inches, which is increasingly popular for PC monitors. It's got the 120Hz box ticked, but it's a TN panel and in terms of native resolution, it's a mere 1080p panel. It's actually a pretty good example of the TN breed, though. You get fairly rich and saturated colours, and the black levels and contrast are streets ahead of what TN technology was capable of just a few years ago. At the same time, however, TN still lags IPS and PVA tech in several areas. The most obvious involves vertical viewing angles, a metric by which the G2773HS is pretty pedestrian. The 1,920 x 1,080 pixel grid is quite low rent for a panel of this size, too. In fact, PC monitor resolutions are looking increasingly measly as tablets and phones pile on the pixels. With Google's Nexus 10 tablet delivering 2,560 x 1,600 pixels in a 10-inch device, 1080p over 27 inches is rather risible. It also means you don't get any extra real estate over your average 22-inch, £100 poverty panel. That said, for gaming, 1080p is arguably the sweet spot. In that context the combination of 120Hz and a fast responding 1ms TN panel is very hard to beat. In fact, Iiyama gives you five switchable levels of pixel overdrive, which allows you to decide just how much you're willing to tolerate in terms of response-related nasties. In practice, it's super slick with overdrive disabled, so that's how we'd run it.